That’s a good twitterfeed to follow. If you’re not a webOS dev, maybe a student but would like a Windows Phone to test it on? 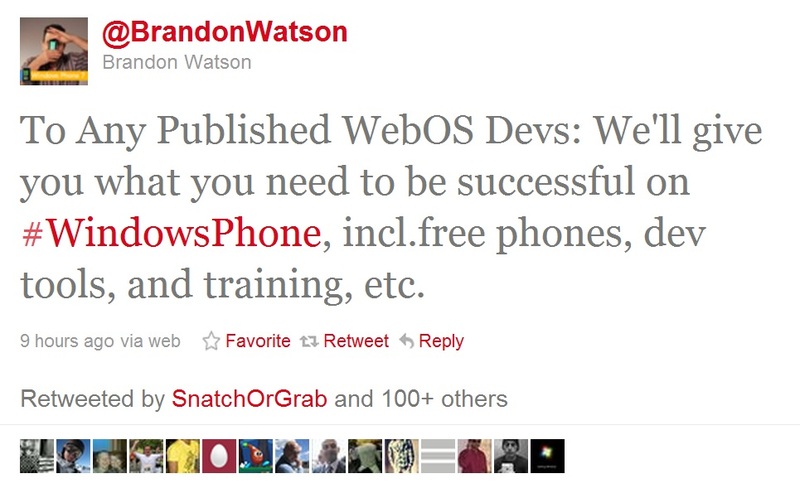 Brandon has had several replies back from published WebOS developers wanting to develop windows phone apps, and even some Palm Developer Relations person getting a job with MS.
Good move to recruit more developers for the platform? 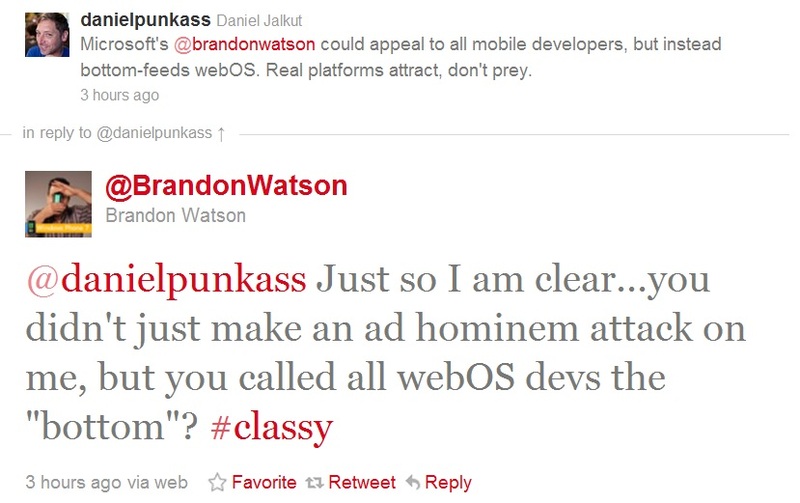 Some snide remarks are made to Brandon that this was preying on these devs (who have no future at least with HP as there’ll be no HP webOS devices). This isn’t just a temporary glitch – this is a dead end for webOS devs. What are they going to do, wait for someone else to pick up the platform – it isn’t even clear yet what will happen to webOS. this isn’t a case of unfortunate downtime. They abandoned the platform. Lives are impacted. We offer an alternative. Again, I say why not? Brandon is trying to get devs from everywhere. He is attracting new people, like that student and other devs from other platforms. You don’t even have to buy that supposed altruistic intention. This is just a good move, as Samsung and Google did, to get devs shying away from one platform to come and join yours. Cheers to Just Visiting for the tip. There’s a point there that many non-WP fans make about WP7’s poor market share. That’s very true. WP7 and webOS are indeed very similar in that they have both received high praises on the blogosphere as an OS (and there are praises for the UI of WP7, just because you dislike it does not mean the prominent view of it is such) BUT poor sales. Microsoft CANNOT afford for this platform to fail. The future of the Windows platform and ecosystem is to branch out into mobile – the aim of Windows 8 and Windows Phone 8. Some say learn from HP and put as much resources as you can, don’t let this flounder with poor support or mismanagement (more recent articles suggest HP never wanted to support webOS anyway). Microsoft has good partners (hello Nokia, Samsung, HTC, LG, Dell, ZTE, Fujitsu) and a great developer network. We’re still pretty much in no man’s land regarding Windows Phone situation (as Mango phones aren’t out yet and still early days). Mango is said to be what WP7 should have been at release. Apollo is going to be where some NokiaWP magic happens. Though a little too distant to wait. Let’s see how MS and Nokia does with the new wave of Windows Phone. « Video: ‘White’ Nokia N9 and indoor N9 video samples.